The Atlanta Life Insurance Company recently celebrated its 100th anniversary with several events chronicled on their official website (click here to view – you will need PowerPoint to view their slide show). Founded by former slave Alonzo Franklin Herndon, Atlanta Life is the largest Black-owned stockholder insurance company in America. 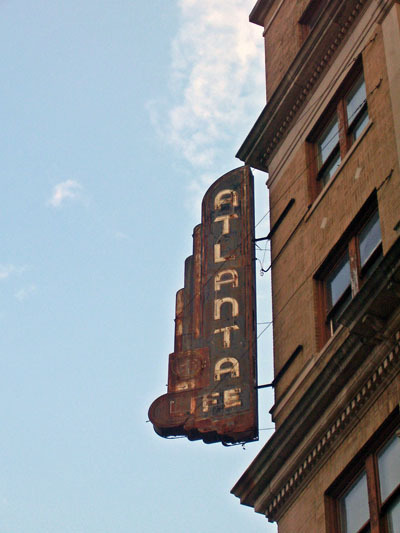 This neon sign hangs at the intersection of 4th Avenue North and 17th Street North on the northwest corner, across the street from the Carver Theatre. The organization currently operates in 17 states across the country, though I do not believe that they currently operate out of the building that the neon sign is attached to. Taking into account the age of the sign, it would be safe to say that it represents the period of the company’s history during which it experienced its biggest growth spurt. Click here for the series homepage, here for the photo gallery and here to view additional images courtesy of the Magic City Flickr Group.